Is this the year of the older, older woman? 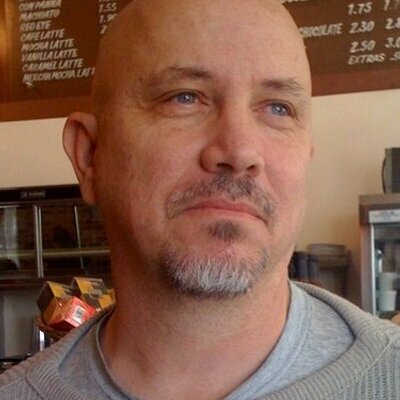 For some reason, a number of films have been released this year with a central character that is probably not only not in any recognized quadrant of the four that studios so dream of capturing, it’s a target audience many producers probably consider non-existent: a female in her somewhat twilight years. These include I’ll See You In My Dreams (Blythe Danner as a widow discovering that life isn’t over by any stretch of the imagination); Grandma (Lily Tomlin as a grandmother helping her granddaughter raise money for an abortion); Youth (Jane Fonda as an aging actress desperately trying to hold on to her career); The Woman in the Van (curmudgeon Maggie Smith as…a curmudgeon in a van). 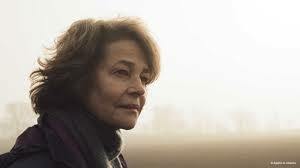 And now we have Charlotte Rampling as Kate Mercer in 45 Years, a heartbreaking and at times emotionally devastating film about a wife who has to reevaluate her more than four decade long marriage in the days leading up to her and her husband’s anniversary. It’s a roster that perhaps is worthy of an entry in the Guinness Books. There’s something odd about my memory of 45 Years. I keep swearing that it was in black and white when I saw it. Yet whenever I see a preview of it, there it is in color. Muted hues, perhaps, but in color all the same. Perhaps it’s my mind creating a metaphor for the film, a bleak and, yes, ultimately downbeat study of a relationship. 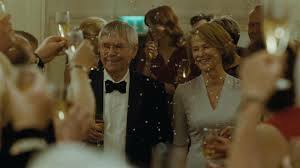 The basic story revolves around Kate and her mate Geoff, two seniors who are planning a party to celebrate the longevity of their marriage. But a week before the festivities, Geoff receives a letter from the authorities in Switzerland. Before Geoff ever met Kate, he took a vacation traveling through the Alps when his girlfriend of the time fell tragically into a crevice. She was never located. Until now. After a freak thaw finally revealed her body. And Kate now has to reconsider everything about her marriage as Geoff seems unable in letting this new information go. He is suddenly thrown into the past, leaving Kate more and more behind at times, while he pretends there is nothing different, nothing going on, like a methinks he doth protest too much cheating husband. But Kate has to fully face the truth that she was never Geoff’s first choice and is only married to him because his original love suddenly disappeared one day. If the woman were alive, Kate would probably never have met Geoff and it might be the other woman who would be celebrating an anniversary this year. Even more devastating, it’s also quite possible that this was also the reason why she and Geoff never had any children. 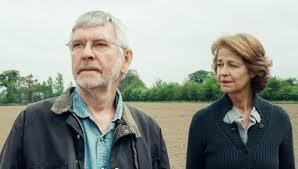 Goeff is played by Tom Courtenay and I’m not sure that either he or Rampling have ever been better. I especially think that for Rampling, this has to be her finest performance. Every hurt, every pain, every bit of anger is so obviously buried in her soul. Meanwhile, she has to pretend that everything is all right, even though she is dying inside, as symbolized by the song played to open their party, Smoke Gets In Your Eyes, a woeful ballad about people who hide the fact that they are suffering. The movie is a touching and moving broken valentine for these two veteran performers and is a wonderful tribute to their long careers. Written and directed by Andrew Haigh, adapted from a short story by David Constantine. Haigh has previously given us Weekend and the TV series Looking. At the beginning of director Justin Kurzel’s new interpretation of William Shakespeare’s classic tragedy Macbeth, Lord and Lady M lay to rest their only child. It’s a scene not in the play (the Macbeths are simply childless with no explanation). It’s a nice touch. A nice addition to the story. A nice interpretation of the play. 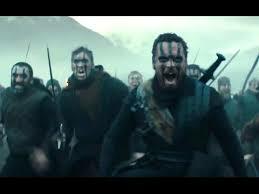 Unfortunately, as highly original as this addition is, it is about the only aspect that anyone involved in the movie brings of any value to the story (I will give the filmmakers one more credit—at the end, rather than have Birnham Wood be chopped down and used as shields for the approaching Macduff army, Macbeth sets it ablaze and the ashes make their way to the murderer’s castle). I fully realize that this version of the play whose title you dare not mention in a theatre without risking a superstitious catastrophe, has its fervent supporters. As for me, it is an utter failure, and on almost every level. The whole movie feels shot in a one note style. The cinematography rarely changes color. Like the sets and costumes, it is muted to the dullest of earth tones. That I might have been fine with. It’s a downbeat play, so there’s no reason it shouldn’t have a downbeat look. 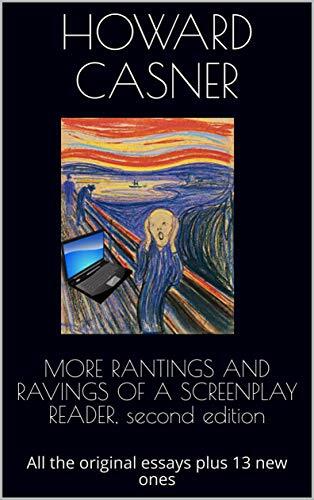 But where the movie lost me was with the acting and line readings, the verse delivered with flat and even intonations with what seemed to be no effort to make it remotely understandable. No one seems to even try to give their lines any clear meaning. And I’m not certain I can disagree. This is the fourth film version of the play that I have seen and like many in the U.S., I had to study it in school. Thankfully, I should add, because if I hadn’t, I’m not sure I would have had the remotest idea what the basic plot was (another friend had simply no idea what Lady Macbeth was talking about during her famous soliloquy, “Out, out, damned spot”). I suppose in all fairness I should mention that this version of the Scottish play is getting all sorts of praise in many circles, and Kurzel is known for a fantastic bit of an equally downbeat earlier vision of cinematic nihilism called Snowtown. But this Macbeth simply didn’t register with me at all. 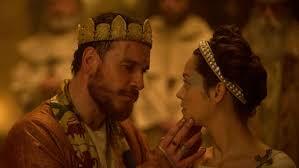 With Michael Fassbender as Macbeth; Marion Cotillard as Lady Macbeth; David Thewlis as Duncan; and Paddy Considine as Banquo. The adaption was done by committee. For some reason it actually took three writers to create this version of the play.